Original brochure is 9 X 6" and opens to 18 X 6". 4 Models: 90 S-202; S-402 A Jr; S-402 AT Jr. Touring; and S-601 Superflow. Discussion, prices, brief specs. Xlnt condition! 1994 AGRALE ENDURO (BRAZIL) SALES BROCHURE. This is an original 1994 AGRALE ENDURO sales brochure. This brochure was printed in Brazil. This brochure has 4 pages of illustrations, specifications and other information. See photos for details. Also a popular item on old-school stingray bicycles and with the 1960’s UK mods who prominently featured them on the aerials, rear racks and/or backrests of their dressed up scooters. 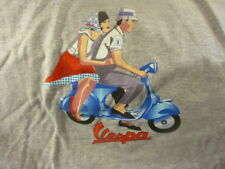 Gently worn grey Vespa retro logo t shirt. Shirt is printed on a 90% cotton 10% polyester` shirt.Size is XL. 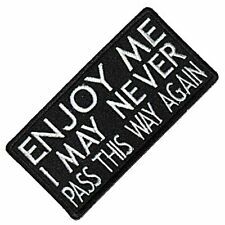 This nylon patch can be sewn or ironed on to your clothing. Discontinued line - reduced to clear - was £3.99. This nylon patch can be sewn or ironed on to your clothing (do not iron on leather). REDUCED - was £2.99. UK: 2nd class free. You may also be interested in. 100mm x 55mm. Black Vespa Sprint GTs 150 160 scooter Model Collectibles. The Trailer Magnet. you see here was custom made. 5 1/2"" in length with variable heights between 3" to 3 1/4". 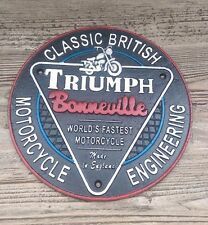 The quality detailed on these are much better on the magnet than shown here and will last many years. A look at the NSU-Lambretta Motor Scooter. We do not photocopy these. from a Bygone Era. Discover a Wealth of How-to Projects & Plans. Grandpa's Secrets. This is an original 1958 print ad for Vespa! If you've seen print ads used in set decoration for TV shows or films, you've likely seen our ads. BEWARE OF FLIMSY ALUMINIUM RETRO COPIES! or CHEAP CHINESE VINYL/PAPER COPIES! High Quality Printing Techniques have been used for the best finish. Made in Yorkshire from strong steel which ensures high rigidity. 1980 Print Ad Vespa Motorcycle Moped Mini-Bike ~ Wow. What Was That? 1980 VESPA Original Print Ad that has been carefully removed from a magazine. Approx size of ad is 8" x 11". Vespa Servizio Coffee Mug Blue - 605304M. BEWARE OF FLIMSY ALUMINIUM RETRO COPIES! or CHEAP CHINESE VINYL/PAPER COPIES! With 4 pre-drilled holes for ease of mounting. High Quality Printing Techniques have been used for the best finish. Made in Yorkshire from strong steel which ensures high rigidity. This shirt was hand screened about 10 years ago and has been boxed since. Large size. Hanes Heavyweight Tee. 1980 Print Ad Vespa Motorcycle Mini-Bike ~ Quick. What's a Vespa? BEWARE OF FLIMSY ALUMINIUM RETRO COPIES! or CHEAP CHINESE VINYL/PAPER COPIES! With 4 pre-drilled holes for ease of mounting. Made in Yorkshire from strong steel which ensures high rigidity. High Quality Printing Techniques have been used for the best finish. Vespa "logo" "70" mug. Part number 606450M00W. Dishwasher safe. 1979 VESPA Original Print Ad that has been carefully removed from a magazine. Approx size of ad is 8" x 11". This is an original 1965 print ad for Fuji Rabbit scooters! If you've seen print ads used in set decoration for TV shows or films, you've likely seen our ads. and go to their missingkids website and look at the pictures of missing children- YOU can make a difference. Hand Carved Wood Art Model Scooter Vespa -Miniature wooden Vespa. Material: wooden. This model was hand-carved from more 15 different pieces of wood with different thickness and glued together on a wood base like puzzle to form this design. 1986 Honda Helix Motorscooter Vintage Ad "...Not Everyone Wants to Look at the.. THIS IS FOR THE AD ONLY NOT THE MAGAZINE. Nice one for your collection. 1989-1990 Honda CH250 Elite CH 250 Scooter Factory OEM Shop Service Manual NICE! 250 Scooter Model CH250. Date of Issue: February, 1990 by Honda Motor Co., LTD. This is an original 1960 print ad for Heinkel scooters! If you've seen print ads used in set decoration for TV shows or films, you've likely seen our ads. The rubber wheels actually roll and it even has a kickstand! Mini ClocksMini Clocks. Warranty does not include lens or case. Q: Are Miniature Clocks hand made?. A: Yes, each mini clock is hand assembled and painted! Watch for our special sales throughout the year!